Received August 28, 2018; Revised September 21, 2018; Accepted September 22, 2018. Maize has high food and industrial value, whereas has difficulties in research because of their complex and huge size genome. Nested association mapping (NAM) was constructed to better understand maize genetics. However, most studies were conducted using the reference genome B73, and only a few studies were conducted on tropical maize. Ki3, one of the founder lines of the NAM population, is a tropical maize. We analyzed the genetic characteristics of Ki3 by using RNA sequencing and bioinformatics tools for various genetic studies. As results, a total of 30,526 genes were expressed, and expression profile were constructed. A total of 1,558 genes were differentially expressed in response to drought stress, and 513 contigs of them come from de novo assemblies. In addition, high-density polymorphisms including 464,930 single nucleotide polymorphisms (SNPs), 21,872 multiple nucleotide polymorphisms (MNPs) and 93,313 insertions and deletions (InDels) were found compared to reference genome. Among them, 15.0 % of polymorphisms (87,838) were passed non-synonymous test which could alter amino acid sequences. The variants have 66,550 SNPs, 5,853 MNPs, and 14,801 InDels, also proportion of homozygous type was higher than heterozygous. These variants were found in a total of 15,643 genes. Of these genes, 637 genes were found as differentially expressed genes (DEGs) under drought stress. Our results provide a genome-wide analysis of differentially expressed genes and information of variants on expressed genes of tropical maize under drought stress. Further characterization of these changes in genetic regulation and genetic traits will be of great value for improvement of maize genetics. Maize (Zea mays L.) is one of the important crops for food, feed, and bioenergy likely rice and wheat. The complexity and enormous size of the maize genome has been a major challenge for maize genome research. To better understand, nested association mapping (NAM) was designed for identifying and dissecting the genetic architecture of complex traits in maize (Yu et al. 2008; McMullen et al. 2009; Li et al. 2016). NAM recombinant inbred lines (RILs) provide chance for discovery accuracy quantitative trait loci (QTLs), genetic traits and high-density genotyping. Release of the maize HapMap (Gore et al. 2009) which provide projection of 1.6 million single nucleotide polymorphisms (SNPs) and insertions and deletions (InDels) identified in the NAM founder lines onto the NAM RILs. The HapMap database lead to successfully genome-wide association study (GWAS) and QTL studies (Kump et al. 2011; Poland et al. 2011; Tian et al. 2011). The candidate genes association approach have identified various quantitative traits in maize (Thornsberry et al. 2001; Wilson 2004; Krill et al. 2010; Yan et al. 2011). Despite these efforts, the complexity of the maize genome remains a major challenge. Drought is a major stress on the cultivation and development of maize. The drought cause negative effects, such as ovule abortion, pollen death, and the anthesis-silking interval (ASI) during the reproductive stages (Hall et al. 1984; Blum 1996; Andrade et al. 1999). Drought stress increases the ASI, which affects negatively the fertilization rate, kernel filling, and seed quality (Byrne et al. 1995; Edmeades et al. 1995; Bolaños and Edmeades 1996; Bruce et al. 2002). For this reason, ASI is frequently used as an index of drought tolerance. Consistent with the diversity of these highly heterozygous plants and their genomic complexity, various genotypes have been found to exhibit different response systems under drought stress (Shinozaki and Yamaguchi-Shinozaki 1997; Hansey et al. 2012; Jiang et al. 2012). Therefore, to improve our understanding of the relationship between drought and yield, it is needed that genetic researches of each NAM founder line under drought conditions. Molecular markers have been widely used for important component of breeding, such as marker-assisted selection (MAS), genetic diversity, and genetic mapping. In addition, the next-generation sequencing method provides a powerful tool that can be used to characterize sequence diversity and genotype for genetic mapping, genetic diversity analysis, and molecular breeding. By the development of RNA sequencing (RNA-seq) technologies and bioinformatics tools, the variants were easier to access and were available. DNA polymorphisms such as single nucleotide polymorphisms (SNPs), multiple nucleotide polymorphisms (MNPs) and insertions and deletions (InDels) could find using RNA-seq data, and will be converted into molecular markers (Setter et al. 2010; Takahagi et al. 2016; Miao et al. 2017). Technological advances and the emergence of NAM have suggested a way to solve difficulties of research due to the complex and huge genomes of maize. Next-generation sequencing (NGS) has greatly facilitated the development of methods to genotype very large numbers of molecular markers such as SNPs and Indels. The NGS can offer genome-wide variants discoveries, even in species that have little or no genetic information available. In maize, NGS has been a very useful technology, which has developed molecular markers and discovered genetic characteristics in a variety of maize resources. The provision of the NAM population has simplified the analysis of maize genetic traits. Research on the NAM founder line is necessary for the efficient use of the NAM population, but research on the NAM founder line remains insufficient understanding. In this study, RNA-seq was used to identify transcriptional variations between Ki3 and the others of NAM population, under drought-stressed at short-day condition. The RNA-seq data were analyzed by using bioinformatics tools to identify changes in gene expression, genetic traits and genetic variants under drought stress. Differentially expressed genes (DEGs) were subjected to BLAST analysis to predict their functions. We identified the SNPs, MNPs, and InDels in these genes. In this study, we focused on drought responsive genes that are known or predicted to be involved in drought stress. We also analyzed non-synonymous variants in DEGs which have potential to change functions. Maize (Zea mays cv. Ki3) were received from Maize genetics cooperation stock center. The plants were grown in 20 L pots in the greenhouse. The temperature was maintained at 28°C during 12 hours with light and 26°C during 12 hours with dark. When the tassel was visible, the plants were divided into two groups, control and drought. The control groups were maintained well-watered conditions, but drought groups were maintained at less than −1.5 MPa of soil water content. When pollen shed began, the flag leaf from each plant was collected. The flag leaf emerges in a determinate plant in the Poaceae species, which means determinate growth and going into reproduction stages. All the collected leaves were immediately frozen using liquid nitrogen and stored at deep-freezer. To construct RNA libraries, leaves from control and drought conditions were subjected to RNA isolation with biological replication. Total RNA was prepared from each leaf using the RNeasy Plant Mini Kit (Qiagen). RNA quality and integrity were assayed with a 2100 Bioanalyzer RNA Nanochip (Agilent Technologies) prior to RNA-seq. RNA-seq analysis was performed using the Illumina HiSeq platform. The raw data for each sample was imported to CLC genomics workbench software (Version 8.0.1, CLC Bio). The overlap settings for this assembly were a mismatch cost of 2, an insert cost of 3, similarity fraction of 0.8, and length fraction of 0.8. In additions, the unmapped reads were de novo assembled with the following parameters: the mismatch count and maximum gap were set to 2, the insertion and deletion costs were set to 3, the minimum contig length was set to 200 bp and the length fraction and similarity parameters were set to 0.5 and 0.9, respectively. The genes and contigs were filtered with absolute log2 fold change value greater than one. The selected DEGs included contigs from de novo results were annotated according to Gene Ontology (GO) terms with the Blast2Go program (Conesa and Götz 2008). For enrichment analysis, the genes were submitted to BiNGO plugins for Cytoscape (Maere et al. 2005) with the Bonferroni correction method (P-value correction with a cut-off of 0.05). With the assembled transcriptome as a reference, the data from Ki3 were aligned for SNPs, MNPs and small InDels identification. The CLC genomics workbench was used to polymorphism detection. The programs based on the neighborhood quality standard algorithm (NQS) and using the following parameters: minimum coverage = 10; minimum central base quality = 30; and minimum allele frequency = 35%. SNPs were filtered by removing those within 10 bp of another variant (both InDels and SNPs). The amino acid changes tools were performed on CLC genomics workbench for non-synonymous test. The RNA was used to construct a cDNA library followed by the PrimeScript First Strand cDNA Synthesis kit (Takara). Twelve genes were chosen for the confirmation of DEGs by qRT-PCR. The qRT-PCR runs were performed with CFX Connect™ Real-Time PCR Detection System (Bio-Rad). The expression value of genes was normalized using CT-values for the reference genes (18s rRNA and Actin1) to determine relative fold changes. Genes and contigs were validated with three independent biological replicates in each sample. The CT values for each DEG under each condition were calculated using ΔΔCT method, as previously described (Livak and Schmittgen 2001). The data sets supporting the results of this article are available in the KOBIC BIODATA repository (https://biodata.kr/), No. 1545012034. RNA samples obtained under drought stress were subjected to RNA-seq by using an Illumina Hi-Seq 2000 sequencing system. A total of 6 samples, three biological replicates were analyzed. For each replicate, 70.7% to 72.7% million reads were obtained. More than 290 million paired reads from control plants and 280 million paired reads from drought stressed plants were analyzed, and 35 million paired reads were aligned on average (Table 1). Of these reads, 71.1% to 71.7% could be mapped to the reference genome (AGPv3.30) as unique and multiple matches. Expression values associated with genes and transcripts were calculated using the read per kilobase of exon per million fragments mapped (RPKM) model. In addition, unmapped reads were able to make de novo assemblies. Totally, 8,256,092 reads and 3,715,908 reads were mapped in pairs from control and drought stressed plants, respectively. Theses reads were used for creating contigs (Supplementary Tables S1 and S2). To characterize as drought stress responsive genes, differential gene expression analysis was conducted from RNA-seq data. A total of 33,138 genes and 11,716 contigs were expressed under both conditions. Of these genes, 1,045 genes and 513 contigs were passed the cut-off and considered to be DEGs (Supplementary Tables S3 and S4). The 586 genes were up regulated, and 459 genes were down regulated under drought conditions. Of the contigs, 150 contigs were up-regulated whereas 363 contigs were down-regulated under drought stress. Consensus sequences for DEGs including contigs were subjected to Blast2GO for prediction of gene function. Almost of the DEGs were identified by GO terms associated with biological process included response to stress, response to endogenous stimulus, and response to external stimulus, which are consistent with drought stress (Fig. 1, Supplementary Table S5). GO terms related to reproductive were also found. The reproductive GO terms included post-embryonic development (Supplementary Table S5). GO terms from the molecular function category involved in response to stress included transporter activity and RNA binding. The whole consensus sequences were analyzed to reveal the genetic variants including SNPs, MNPs, and InDels (Table 2). After alignment, variants calling, and filtration, a total of 585,377 high confidence variants were identified among both conditions (Supplementary Table S6). The distribution of SNPs was the highest and the number of InDels were similar. The proportion of homozygous was overwhelmingly higher than heterozygous polymorphisms. The distribution of variants was shown approximating that of gene density across the maize chromosomes. The distribution of variants depends on size of chromosome and the distribution of each variants type was similar (Fig. 2). Of these variants, number of 87,838 variants were passed non-synonymous test which could make functional changes. The variants have 66,550 SNPs, 5,853 MNPs, and 14,801 InDels, also proportion of homozygous type was higher than heterozygous. These variants were found in a total of 15,643 genes. Of these genes, 637 genes were found as DEGs under drought stress (Supplementary Table S7). Of these genes, Number of 222 DEGs were classified as GO term for response to stress (GO: 0006954) and 130 genes were found to have one or more non-synonymous variants. Likewise, among the 45 DEGs related to reproductive, which were classified to post-embryonic development (GO: 0009791). To confirm the accuracy of RNA-seq results, expression of 6 DEGs and 6 contigs was validated by qRT-PCR for the three biological replicates (Fig. 3). All of genes were classified which have GO terms for response to stress (GO: 0006950) by blast analysis. The correlation between RNA-seq data and qRT-PCR was evaluated by comparing log2 fold changes in gene expression. The qRT-PCR results revealed that the expression pattern of these genes similar to that observed in the expression values from RNA-seq. The maize breeding was primarily associated with greater stress tolerance and yields. However, the diversity of maize genomes and genetic characteristics has reduced the concentration of research. NAM has been designated to increase understanding of the complex and enormous maize genome. The drought is one of the factors that have greatest effect on the growth and yield of maize. In this study, we analyzed Ki3, one of the NAM founder lines to investigate changes in drought and genetic variation for aid maize genome research. As a result, we found DEGs from RNA-seq and differentially expressed contigs from de novo analysis. The contigs were analyzed and predicted their function using blast. Several contigs have functions related to drought tolerance and reproductive stage. Especially, the eight contigs (contig nos. 9052, 11007, 12335, 18773, 18778, 18848, 18887, and 19286) have GO terms for response to stress. This new discovery of maize genetic traits will help to understand of drought response system. The 10 genes (GRMZM2G051943, GRMZM2G313184, GRMZM2G450125, GRMZM2G360681, GRMZM2G098167, GRMZM2G024668, GRMZM5G801627, GRMZM2G042789, GRMZM2G117942, and AC208204.3_FG006) were found in list of GO terms for response to stress. These genes were shown to respond to drought in Ki3 as well as in B73 (Min et al. 2016; Song et al. 2017; Zhang et al. 2017). These genes were shown to respond to drought in Ki3 as well as in B73. Some transcription factors and binding factors also were shown in DEGs. Representatively, the GRMZM2G117608 has sequence predicted to calmodulin binding protein which reported to positive regulator of drought tolerance in Arabidopsis (Wan et al. 2012). Likewise, GRMZM2G065989 which encode SPX (SYG1/Pho81/XPR1) domain-containing protein were up regulated under drought. The SPX proteins were reported that an adverse environment can induce genome-wide changes in DNA methylation, specifically in stress-related genes in plant (Wang et al. 2009; Gao et al. 2014; Thatcher et al. 2016). However, except for these genes, most of the genes are not expressed in the previous experimental results. Many genes have different expression patterns, and it is suggested that are characteristic of Ki3 and tropical maize, also these genes are indirect evidence that the drought response system for each variety is different. We found genetic variation of Ki3 against reference genome. Most variants (87.9%) were homozygous. It is suggested that Ki3 is genetically stable and the variants were fixed. Of the variants, 87,838 variants including SNPs, MNPs, InDels and replacements were passed non-synonymous test. These variants could make a functional change of genes. Our results provide that 15,643 genes have one or more non-synonymous variants on EST, have potential to development gene-based and functional markers. This genetic variation represents the genetic character of Ki3 and will play an important role in functional studies. Totally, number of 130 DEGs which have non-synonymous variants were classified as GO term for response to stress (GO: 0006954). This is a very high rate (73.0%) compared to other Go term (overall average, 38.3%). Genetic variants that are likely to cause functional mutations and genetic properties of Ki3 provide the information for NAM-population studies and molecular marker development. Recently, due to the development of technologies and bioinformatics, genetic traits have quickly attracted study. The analyzation of drought responsive genes that related to drought tolerance and yields using recent data was performed. However, there was a difference in the drought response system of tropical maize and temperate maize, and each variety. In Ki3, only about 70% of the total transcriptome were matched the reference genome. There are 585,377 gene-based genetic variants including 87,838 non-synonymous variants. We found 11,716 contigs including 513 differentially expressed contigs in drought from de novo assembly using unmapped reads. Overall, our results provide a genome-wide analysis of differentially expressed genes during the reproductive stage of maize under drought stress, and information of variants on expressed genes. Further characterization of these changes in genetic regulation and genetic traits will be of great value for improvement of maize genetics. This work was carried out with the support of “Cooperative Research Program for Agriculture Science & Technology Development (Project No. PJ012649022018)” Rural Development Administration, Republic of Korea. This research was also supported by Administration, Republic of Korea, the Golden Seed Project (213009-05-2-SB710), Ministry of Agriculture, Food and Rural Affairs (MAFRA), Ministry of Oceans and Fisheries (MOF), Rural Development Administration (RDA), and Korea Forest Services (KFS). Fig. 1. Enrichment analysis of drought responsive genes using GO terms from GO-Slim. 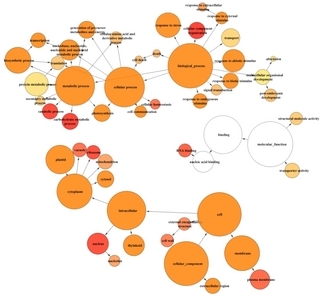 Significantly overrepresented GO Slim terms were visualized by BiNGO as an application in Cytoscape. Fig. 2. Circos diagram depicting the gene expression and genetic variants. 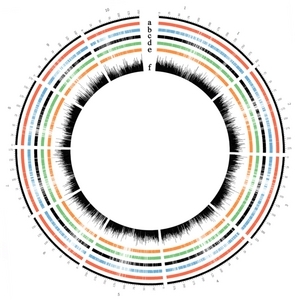 The six concentric rings represented each of variants, respectively (a: SNPs, b: MNPs, c: Insertions, d: Deletions, e: non-synonymous variants, f: gene expression values). Fig. 3. 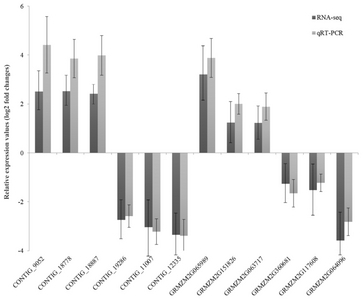 Validation of relative gene expression from RNA-seq by qRT-PCR. Relative expression values of RNA-Seq and qRT-PCR are presented as an average value ± SD of three biological replicates. Summary of alignment results from RNA-seq data of each sample. Summary of identified genetic variants. Numbers in parentheses mean non-synonymous variants. Andrade, FH, Vega, C, Uhart, S, Cirilo, A, Cantarero, M, and Valentinuz, O (1999). Kernel number determination in maize. Crop Sci. 39, 453-459. Blum, A (1996). Crop responses to drought and the interpretation of adaptation. Plant Growth Regul. 20, 135-148. Bolaños, J, and Edmeades, GO (1996). The importance of the anthesis-silking interval in breeding for drought tolerance in tropical maize. Field Crops Res. 48, 65-80. Bruce, WB, Edmeades, GO, and Barker, TC (2002). Molecular and physiological approaches to maize improvement for drought tolerance. J Exp Bot. 53, 13-25. Byrne, PF, Bolaños, J, Edmeades, GO, and Eaton, DL (1995). Gains from selection under drought versus multilocation testing in related tropical maize populations. Crop Sci. 35, 63-69. Conesa, A, and Götz, S (Array). Blast2GO: A comprehensive suite for functional analysis in plant genomics. Int J Plant Genomics. Edmeades, GO, Bolaños, J, Lafitte, HR, and Listman, GM (1995). Progress in breeding for drought tolerance in maize. Entwicklung und laendlicher Raum (Germany). 29, 29-30. Gao, H, Jin, M, Zheng, XM, Chen, J, Yuan, D, and Xin, Y (2014). Days to heading 7, a major quantitative locus determining photoperiod sensitivity and regional adaptation in rice. Proc Natl Acad Sci USA. 111, 16337-16342. Gore, MA, Chia, JM, Elshire, RJ, Sun, Q, Ersoz, ES, and Hurwitz, BL (2009). A first-generation haplotype map of maize. Science. 326, 1115-1117. Hall, AJ, Chimenti, C, Trapani, N, Vilella, F, and de Hunau, RC (1984). Yield in water-stressed maize genotypes: Association with traits measured in seedlings and in flowering plants. Field Crops Res. 9, 41-57. Hansey, CN, Vaillancourt, B, Sekhon, RS, de Leon, N, Kaeppler, SM, and Buell, CR (2012). Maize (Zea mays L.) genome diversity as revealed by RNA-sequencing. PLoS ONE. 7, e33071. Jiang, T, Fountain, J, Davis, G, Kemerait, R, Scully, B, and Lee, RD (2012). Root morphology and gene expression analysis in response to drought stress in maize (Zea mays). Plant Mol Biol Rep. 30, 360-369. Krill, AM, Kirst, M, Kochian, LV, Buckler, ES, and Hoekenga, OA (2010). Association and linkage analysis of aluminum tolerance genes in maize. PLoS ONE. 5, e9958. Kump, KL, Bradbury, PJ, Wisser, RJ, Buckler, ES, Belcher, AR, and Oropeza-Rosas, MA (2011). Genome-wide association study of quantitative resistance to southern leaf blight in the maize nested association mapping population. Nat Genet. 43, 163-168. Li, YX, Li, C, Bradbury, PJ, Liu, X, Lu, F, and Romay, CM (2016). Identification of genetic variants associated with maize flowering time using an extremely large multi-genetic background population. Plant J. 86, 391-402. Livak, KJ, and Schmittgen, TD (2001). Analysis of relative gene expression data using real-time quantitative PCR and the 2−ΔΔ CT method. Methods. 25, 402-408. Maere, S, Heymans, K, and Kuiper, M (2005). BiNGO: a Cytoscape plugin to assess overrepresentation of gene ontology categories in biological networks. Bioinformatics. 21, 3448-3449. McMullen, MD, Kresovich, S, Villeda, HS, Bradbury, P, Li, H, and Sun, Q (2009). Genetic properties of the maize nested association mapping population. Science. 325, 737-740. Miao, Z, Han, Z, Zhang, T, Chen, S, and Ma, C (2017). A systems approach to a spatio-temporal understanding of the drought stress response in maize. Sci Rep. 7, 6590. Min, H, Chen, C, Wei, S, Shang, X, Sun, M, and Xia, R (2016). Identification of drought tolerant mechanisms in maize seedlings based on transcriptome analysis of recombination inbred lines. Front Plant Sci. 7, 1080. Poland, JA, Bradbury, PJ, Buckler, ES, and Nelson, RJ (2011). Genome-wide nested association mapping of quantitative resistance to northern leaf blight in maize. Proc Natl Acad Sci USA. 108, 6893-6898. Setter, TL, Yan, J, Warburton, M, Ribaut, JM, Xu, Y, and Sawkins, M (2010). Genetic association mapping identifies single nucleotide polymorphisms in genes that affect abscisic acid levels in maize floral tissues during drought. J Exp Bot. 62, 701-716. Shinozaki, K, and Yamaguchi-Shinozaki, KY (1997). Gene expression and signal transduction in water-stress response. Plant Physiol. 115, 327-334. Song, K, Kim, HC, Shin, S, Kim, KH, Moon, JC, and Kim, JY (2017). Transcriptome analysis of flowering time genes under drought stress in maize leaves. Front Plant Sci. 8, 267. Takahagi, K, Uehara-Yamaguchi, Y, Yoshida, T, Sakurai, T, Shinozaki, K, and Mochida, K (2016). Analysis of single nucleotide polymorphisms based on RNA sequencing data of diverse bio-geographical accessions in barley. Sci Rep. 6, 33199. Thatcher, SR, Danilevskaya, ON, Meng, X, Beatty, M, Zastrow-Hayes, G, and Harris, C (2016). Genome-wide analysis of alternative splicing during development and drought stress in maize. Plant Physiol. 170, 586-599. Thornsberry, JM, Goodman, MM, Doebley, J, Kresovich, S, Nielsen, D, and Buckler, ES (2001). Dwarf8 polymorphisms associate with variation in flowering time. Nat Genet. 28, 286-289. Tian, F, Bradbury, PJ, Brown, PJ, Hung, H, Sun, Q, and Flint-Garcia, S (2011). Genome-wide association study of leaf architecture in the maize nested association mapping population. Nat Genet. 43, 159-162. Wan, D, Li, R, Zou, B, Zhang, X, Cong, J, and Wang, R (2012). Calmodulin-binding protein CBP60g is a positive regulator of both disease resistance and drought tolerance in Arabidopsis. Plant Cell Rep. 31, 1269-1281. Wang, C, Ying, S, Huang, H, Li, K, Wu, P, and Shou, H (2009). Involvement of OsSPX1 in phosphate homeostasis in rice. Plant J. 57, 895-904. Wilson, LM, Whitt, SR, Ibáñez, AM, Rocheford, TR, Goodman, MM, and Buckler, ES (2004). Dissection of maize kernel composition and starch production by candidate gene association. Plant Cell. 16, 2719-2733. Yan, WH, Wang, P, Chen, HX, Zhou, HJ, Li, QP, and Wang, CR (2011). A Major QTL, Ghd8, plays peiotropic roles in regulating grain productivity, plant height, and heading date in rice. Mol. Plant. 4, 319-330. Yu, J, Holland, JB, McMullen, MD, and Buckler, ES (2008). Genetic design and statistical power of nested association mapping in maize. Genetics. 178, 539-551. Zhang, X, Liu, X, Zhang, D, Tang, H, Sun, B, and Li, C (2017). Genome-wide identification of gene expression in contrasting maize inbred lines under field drought conditions reveals the significance of transcription factors in drought tolerance. PLoS ONE. 12, e0179477.